As I was doing my research on gender bias in the video game industry I decided to search for a few articles about games “recommended for girls” because why not, let’s see what other think it’s appropriate to play for my gender. Google had a few results for me, from small flash games like dress up dolls and Mario remakes, you know, games you could just as easily play on Facebook, to articles about badass female characters and women that made an impact in the industry. It was all well and good, but one particular article stood out from the rest. Just like a sore thumb, this piece of writing stared back into my soul as I was consuming it. The article itself was a big listicle with game recommendations for boys who want to play video games with their non-gamer girlfriends. Ok, so here I try not to be biased in any way. It just says ‘hey a girl would enjoy these’. I’m a girl, I would enjoy these. Would I, though? I delve into the article headfirst and see a few titles that I have indeed played and enjoyed a lot. Some I would check out and some, especially the number one, were terrible. But the descriptive part of the games was so bad. And the reasoning to play those games, Jesus! Women would totally only play horror games to jump in their man’s arms or I’m only playing this because Mickey Mouse is in it. Really? Men left comments on this article about how bad and sexist it is. But anyway, the point of this article is not to rant about online sexism, but to do some justice. I’m writing my own listicle of video game recommendations for girls, by a gaming girl. I have played all of these and loved them, so you will probably love them too. The games are both single and multiplayer. One thing they have in common? Awesome playable female characters. If you enjoy reading, you will love these. The stories are immersive, the game’s art style is beautiful and the characters are loveable and relatable. 1. Night in the woods has anthropomorphic characters and a gorgeous soundtrack. You will explore a dreamlike world with a cat character named Mae, who has nightmares and quit college due to paranoia. She’s a wild spirit that enjoys exploring her small town and doing crimes with her best friend. 2. Broken Age is a point and click game with pretty simple controls. Some backgrounds look like they were painted in crayons. It’s split into two stories: one of a boy who tries to find independence from his mother, and one of a girl who is supposed to be a virgin sacrifice to a monster, no blood or creepiness included. Vela, our girl, fights the patriarchy and everyone else in order to take down the monster and save every other girl that is mean to be an offering. 3. 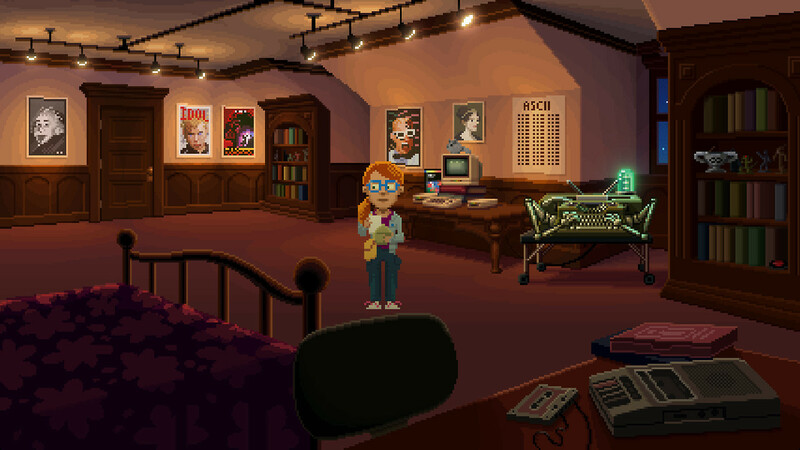 Thimbleweed Park is another point and click game with pixel art and a throwback to the eighties. The game has two lead female characters, an FBI agent and a game programmer. With witty commentary about working in the gaming world, lots of fourth wall breaks and red herrings such as collecting 35 pecks of dust, you can go through the entire game very fast and enjoy it. It gives a feeling of Twin Peaks and Gravity Falls. 4. Danganronpa, this used to be a game known mostly only by anime fans, but it’s gathered a bigger audience over the years. The mechanics are those of a visual novel with mini games. That means tons of dialogue boxes. The story however is what really gets you hooked. You’ll meet your school mates, relate to some, come to love some of them and then one of them is murdered. You find the body, you investigate it and then go to trial to convict one of your classmates in order for the rest of the class to survive. RPGs usually consists of turn based attacks, loot and lots of grinding for levels, gears and ridiculous side-quests that take you across the same map 5 times. 1. Borderlands 2 is an action shooter with RPG elements, meaning that you grind for the loot and quests across the map as you get to shoot versatile, colorful and sometimes talking weapons at the enemies. The story has lots of elements of humor in it. But the game has tragedy too. And you can play this game with your significant other. 2. Kingdom Hearts combines Final Fantasy’s RPG elements with Disney Characters. The bizarre Japanese storytelling is ever present in the game, but the gameplay makes it loveable, and the enemies are as cute as the characters. 3. Grand Knights History is a JRPG for PSP that has, at some point, a multiplayer campaign where you train 4 knights to fight other knights, dragons and skeletons. Visually it is exceptional due to its painted by hand backgrounds that move along with you. So create your own team of strong ladies that take down dragons. This list could last on forever, but no one has that much free time. Other honorable mentions that didn’t make it in this list are a Stardew Valley and My Time at Portia, if you feel like having a great time farming and meeting virtual people. And if you feel like mashing some buttons to let off some steam, then you should try Dynasty Warriors or Devil May Cry.